Marissa Mayer apparently doesn't care for BlackBerry. This was evident back in September when she announced that Yahoo! employees had to kick their BlackBerry to the curb and opt for an iPhone 5, Lumia 920 or Galaxy S3 instead. Mayer took another jab at RIM during an interview with Fortune last night, inferring that a BlackBerry isn't even considered a smartphone. 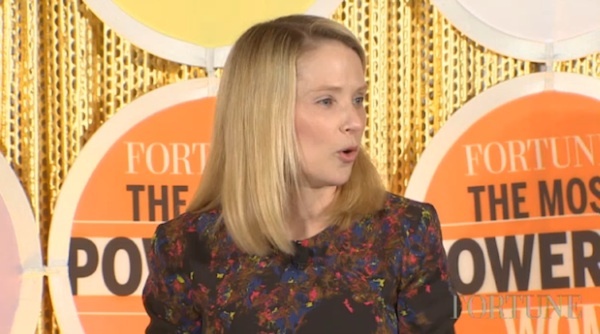 "One of the really important things for Yahoo's strategy moving forward is mobile," she said. "So it was really important that our engineers, our salespeople, really everyone throughout our whole organization really understand Android, iPhones, and, you know, Windows 8 and really get a sense of what's happening there and how to create an amazing experience... so we decided we wanted to get everyone upgraded to smartphones." They are called BlackBerry Smartphones for crying out loud. We get that there are things going on with all of these platforms, but make no mistake Miss Mayer - BlackBerry can't be counted out. BlackBerry 10 is just the "amazing experience" you're referring to, and it's most definitely a smartphone -- or better yet -- a mobile computing platform. Not to mention the thousands of people that are still easily using Yahoo! through BIS thanks to their BlackBerry. And for the record, everything you mentioned in your interview can be done just fine on a BlackBerry, and soon even better on BlackBerry 10. We really don't think that what device your employees are using should be at the top of your to-do list either. Yahoo! has quite a long road to plow if there are hopes of ever being relevant again. Stop jumping on the BlackBerry Bashing Bandwagon just to get your name in a story and focus on your product before it becomes even more forgetable. Somehow, Marissa, I think we'll find the strength to go on living. Feel free to Tweet Marissa Mayer and let her know just how relevant BlackBerry is!